Analysts of post-World War II, post-Holocaust Eastern Europe coined the term “Anti-Semitism without Jews” to characterize the uncanny persistence of prejudice in countries mostly cleansed of any actual Jewish presence. The category of “Jew” took on a symbolic character, incorporating historical prejudices, a deflection of the Communist politics of fear, exclusive national and social identities, and a coded opposition to the rulers. Something similar seems to be happening in this region today, but “the refugee” has been substituted as the symbolic antagonist. The difference is that this new phobia is generated by freely-elected governments, rather than bubbling up spontaneously from below. 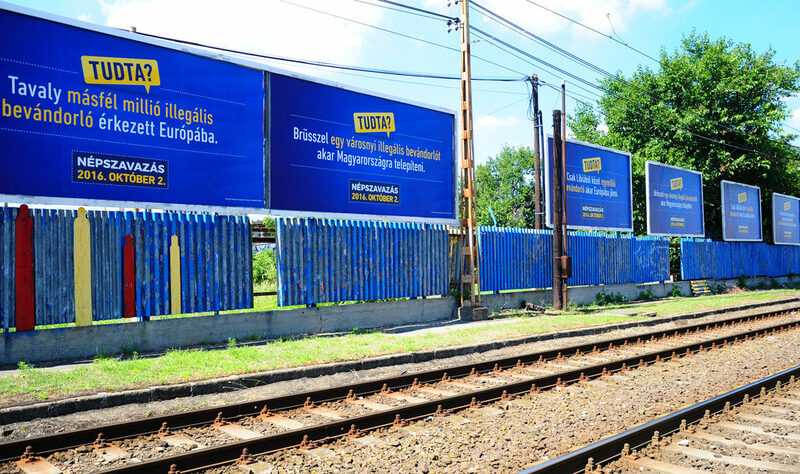 Government-funded anti-refugee billboards blanketing the Hungarian landscape. The referendum was formulated by Prime Minister Viktor Orbán’s government to read: “Do you want the European Union, even without the [Hungarian] Parliament’s involvement, to be able to order the obligatory settlement of non-Hungarian citizens in Hungary?” There is currently no European Union (EU) mandate in place to resettle refugees across all 28 member states. Such a proposal was considered last year during the refugee crisis, when almost a million would-be immigrants, most from war-torn countries such as Syria, Iraq and Afghanistan, made their way to Greece and up through the Balkans, through Hungary towards more developed Western and Northern European destinations. (See my article in the October, 2015 Public i.) But in the face of determined opposition led by the so-called “Visegrad Group” of countries (in addition to Hungary, the Czech Republic, Poland and Slovakia), the proposed regulation was withdrawn; a more limited proposal is under discussion, but is, at a minimum, months away from being enacted. During that 2015 crisis, German Prime Minister Angela Merkel’s astonishing open-door response, accepting over a million immigrants in 2015 (this figure includes those who arrived by other routes) provided a negative example for Orbán, and for many Hungarians and other East Europeans who felt they could not afford such generosity. (Merkel herself has faced a backlash within Germany, and subsequently admitted “mistakes” in refugee policy, which has been tightened.) The Hungarian PM, who has intensified his rhetorical and political anti-EU stance over the past several years, sees an opening to increase his European profile. Harnessing widespread resentment towards refugees, he aspires to assemble and lead a conservative nationalist bloc within the EU that opposes not only refugee resettlement but EU bureaucratic and political overreach in general. The fear campaign in the months leading up to the vote last month, backed by unprecedented government propaganda expenditures, follows a well-worn script to distract citizens from widespread economic hardship, and the ruling party’s corruption and ever-escalating consolidation of power in all spheres. Although 2015 asylum applications to Hungary were actually the highest per capita in Europe (second only to Germany in total), this was due to its location on the new transit route, and to EU rules mandating applications be made in the country of first arrival. Practically none of the refugees wanted to stay in Hungary—they were bound and determined to reach countries where there were more opportunities for work and fellow countrypeople to receive them, primarily Germany and Great Britain. The completion of a fence along the whole of Hungary’s southern border with Serbia and Croatia, and stepped-up, robust enforcement of a “zero tolerance” policy, has slowed new entries to a trickle (and spawned criticism by Human Rights Watch and others, including reports of brutality against asylum-seekers). The Hungarian Red Cross estimates the number of refugees in Hungary at between 3500 and 4500 at any one time—less than 0.05% of the population. In the first five months of this year, a mere 76 asylum applications were accepted (as compared with 174,400 for 2015). Thus, in sharp contrast to e.g. Germany, encountering a refugee in Hungary is hardly a common occurrence. The government’s billboard campaign was quickly countered by the absurdist Two-Tailed Dog Party, which collected enough money from those opposed to the fear campaign for a widespread counter-campaign of billboards and paid posters, as well as stickers put up by volunteers. 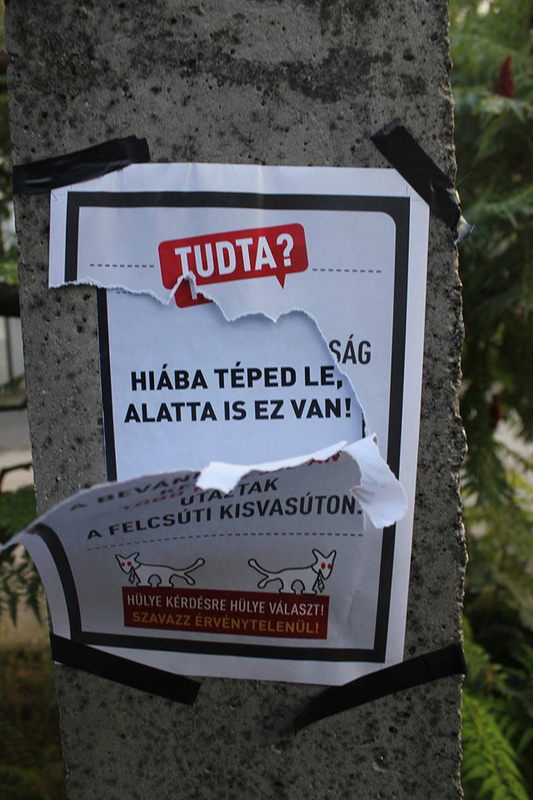 These messages, with the tagline “Stupid Answer to a Stupid Question” (referring to the referendum question), all featured the official lead-in “DID YOU KNOW?,” followed by more or less ridiculous statements, such as “An average Hungarian will see more UFOs than refugees in his/her lifetime,” “Since the beginning of the migrant crisis, there have been more blue billboards [in Hungary] than immigrants,” “As long as people are worrying about refugees, less needs to be spent on the health care system,” and “In Syria, there’s a war on.” The messages encouraged people to “vote invalid”—that is, to spoil their ballots. The tactical aspect of this was that voting rules require valid votes by at least 50% of eligible voters. The serious opposition, meanwhile, was split between those advocating a boycott, with the same calculation, and a smaller proportion that, for moral and political reasons, pushed a “Yes” vote, to show support for Europe and a pro-refugee stance. 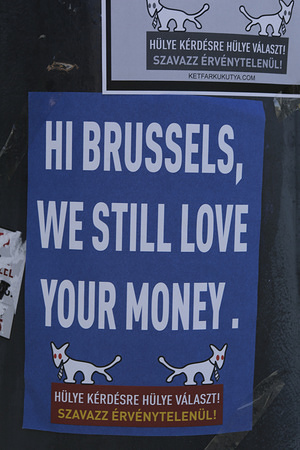 Poster of the Two-Tailed Dog Party opposing the government anti-EU campaign. Hungary receives billions in EU funds every year. The government’s stretch-run effort shifted from button-pushing rhetoric to blunt force, with new billboards, in the national colors, stating “Let’s not risk it – VOTE NO!” The Two-Tailed Dog Party stickers were widely defaced or ripped down, including in my neighborhood (a fairly prosperous, and fairly right-wing, one in the first district). Over 97% of votes cast on October 2 supported the government position; but the total of valid votes was about 3.3 million, just over 42% of eligible voters—making the referendum a failure, legally. While the opposition trumpeted this as a success, the government cited the almost unanimous support of those who voted as a vindication, and potent ammunition to push the anti-refugee position in EU forums, as well as an anti-refugee amendment to the Hungarian Constitution. Orbán is sure to find allies in the other Visegrad countries, at the very least, who have been no less extreme than Hungary in their anti-refugee rhetoric and advocacy. Despite having even fewer actual migrants among them, due to their location off the beaten path of the main transit route, they also refuse quotas, or offer to take Christian refugees only. East Europeans and their leaders alike have been roundly criticized for their uncaring and “backwards” stance towards those fleeing war and suffering. But it behooves Western critics to keep in mind the often less-than-enlightened reactions (Merkel’s excepted) in their own countries, from attacks on refugee shelters in Germany; the misery of camps such as the infamous Jungle near Calais, France, recently and brutally closed; the virulence of anti-immigrant rhetoric in the Brexit debate; and the rise of anti-immigrant parties and politicians across Western Europe—not to mention Mr. Trump and his “beautiful wall.” East Europeans, themselves migrants in the millions in the wealthier countries of the EU, are themselves subjected to anti-immigrant rhetoric—Poles were a particular target during the Brexit run-up—and even verbal abuse, beatings and worse: in late August a factory worker in Harlow, England was murdered by a group of local youths for speaking Polish. The picture is hardly black-and-white; as so often, those themselves suffering inequality turn against those even lower on the perceived totem pole. Two days before the referendum, thousands of Hungarians, bearing signs such as “Do no harm!” and “I was once a refugee” and endorsed by leading writers, singers, film and theater directors and other cultural luminaries, demonstrated in front of Parliament, showing that a more universal humanitarianism is not absent here. They, along with the millions who didn’t cast a valid vote—whether from conviction or passivity—give hope that another (Eastern) Europe is possible. 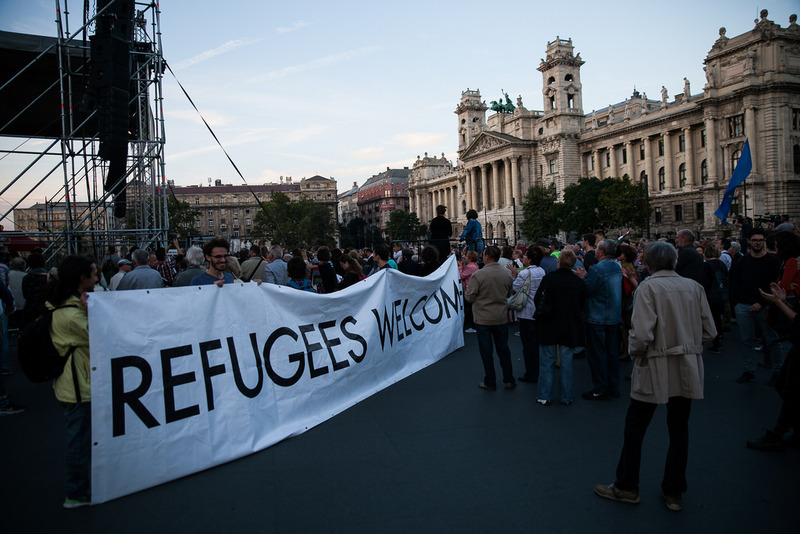 Pro-refugee demonstration in Budapest on September 30. 12-year resident of Urbana, taught history for several years at UIUC, specializing in Eastern Europe; contract not renewed due to budget cuts, currently self-employed; longtime activist in peace/green/social justice/solidarity movements; father of two, including Public i alumna Shara. This entry was posted in International, Politics, Refugees. Bookmark the permalink.